What Is DD Form 2475? DD Form 2475, DoD Educational Loan Repayment (LRP) Annual Application is a form used by service members to request the Army to pay off a portion of their student loans. The provided information will be reviewed by the Military Service Personnel record custodian to verify that eligibility requirements are met. 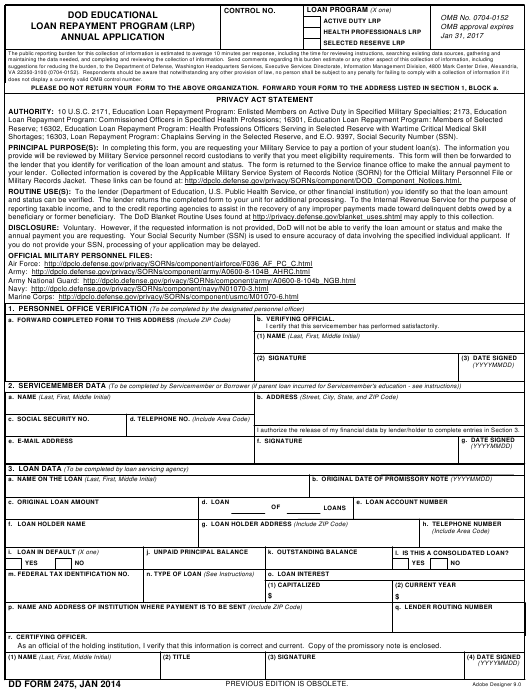 The latest version of the form - sometimes incorrectly referred to as the DA Form 2475 - was released by the Department of Defense (DoD) in January 2014. An up-to-date DD Form 2475 fillable version is available for download and online filing below or can be found through the Executive Services Directorate website. Filing the form is voluntary. However, failure to provide the necessary information will result in the DOD not being able to verify the amount and status of the loan and make the requested payments. How To Fill Out Dd Form 2475? PLEASE DO NOT RETURN YOUR FORM TO THE ABOVE ORGANIZATION. FORWARD YOUR FORM TO THE ADDRESS LISTED IN SECTION 1, BLOCK a. Shortages; 16303, Loan Repayment Program: Chaplains Serving in the Selected Reserve, and E.O. 9397, Social Security Number (SSN). Military Records Jacket. These links can be found at: http://dpclo.defense.gov/privacy/SORNs/component/DOD_Component_Notices.html. beneficiary or former beneficiary. The DoD Blanket Routine Uses found at http://privacy.defense.gov/blanket_uses.shtml may apply to this collection. you do not provide your SSN, processing of your application may be delayed. I certify that this servicemember has performed satisfactorily. I authorize the release of my financial data by lender/holder to complete entries in Section 3.
l. IS THIS A CONSOLIDATED LOAN? m. FEDERAL TAX IDENTIFICATION NO. As an official of the holding institution, I verify that this information is correct and current. Copy of the promissory note is enclosed. DD FORM 2475, "DOD EDUCATIONAL LOAN REPAYMENT PROGRAM (LRP) ANNUAL APPLICATION"
determines to be critical to meet wartime medical skill shortages; William D.
3.a. Name as it appears on the promissory note. information regarding the education for which the loans were incurred. 3.p. Complete this block only if different than the one listed in 3.f. and 3.g. of 3 loans, and loan 3 of 3 loans. 3.q. Lender may not use a routing number as the payment address. are applied to the correct amount. 4.b. Amount cancelled after Origination Date of Loan. 3.i. Mark X in the appropriate box. 4.d. Date of each individual disbursement. or "No" indicating consolidating action. Section I is the Personnel Office Verification. This section is completed by a designated personnel officer. It requires the address where the completed form is forwarded to along with the name and signature of a verifying official and the date of signing. Section II - Servicemember Data - is to be completed by the service member filing for assistance. The personal identifying data includes the name, SSN, home address and email address of the service member along with their signature and date of filing. The service member's full name and the last 4 digits of their SSN must be provided in Section V, Remarks if the Borrower is the parent and has a Parent Loan for Undergraduate Students incurred for the servicemember's education. Section III - Loan Data - is to be completed by the loan servicing agency. Box A requires the name as it appears on the promissory note. Box B requires the original date of the promissory note in YYYYMMDD format. Box C is for the original loan amount. Box D is for the overall number of loans. Box E is for the loan account number that is to be used to ensure payments are applied to the correct amount. Boxes F through H require the name, address, and telephone number of the institution that currently services the loan. Box I is for the loan in default. Box J is for the unpaid principal balance. Box K requires stating the outstanding balance. Box L questions whether the loan is consolidated. Box M requires the Federal Tax Identification number. Box N requires to define the type of loan. The full list of loan types can be found at the bottom of the form. Box O is for specifying the loan interest. Box P is to be filled with the name and address of the institution where payments are to be sent. Box Q is to be completed with the lender routing number. Box R is for verification from the certifying officer, with boxes for their name, title, signature, and date. Section IV consists of four columns that have to do with loan data and must also be completed by the loan servicing agency. Section V is for any extra remarks. These include any additional information that might assist in processing the application. The completed and signed DD 2475 form is to be sent to the address listed in Section I, Box A.